CSS Specificity - Which CSS Rule to apply? Each CSS selector has a specificity value, and more specific selector has the higher precedence it has. If multiple selectors apply to a single element, the highest specificity CSS rule apply to the element. Have you had an experience where you define a CSS rule for an element, and it doesn't work? You probably have a CSS rule that has a higher specificity value which causes your newly created CSS rule to not apply. Which CSS rule applies to an element? How to exclude certain folders from Eclipse Search. One of the time-saving setting you can add to your eclipse preferences is to limit your file searches to your source code, and exclude 3rd-party folders. Such folders may include .git, .svn, cache or templates_c folder from smarty. There are a few different ways to accomplish this. 1. On the Eclipse File Explorer, right click on the folder that you want to exclude and choose "Properties". 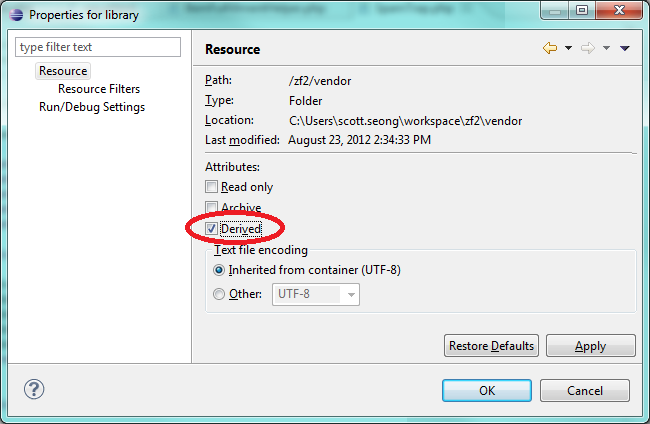 On the "Resource" screen, mark a folder Derived. Derived folder is excluded from search by default.